Component 3.1: Understands the physical characteristics, cultural characteristics, and location of places, regions, and spatial patterns on the Earth’s surface. 3.1.1 Understands and applies basic mapping elements such as symbols, compass rose, labels, and a key to read and construct maps that display information about neighborhoods or local communities. 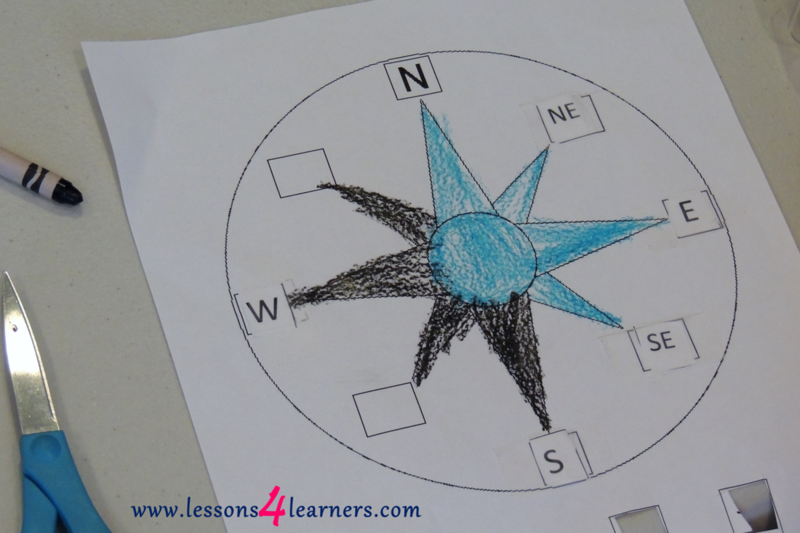 Prepare for the activity by printing off the compass rose and directions that have been provided. If desired you can make the compass reusable by laminating each of the components and applying Velcro to each of the pieces. Otherwise, students can cut and glue the pieces themselves. Be sure to review each of the cardinal and ordinal directions before beginning the activity as well as the abbreviations for each. There are numerous rhymes and songs that go with directions. Singing one with them before the activity as a refresher is recommended. Also, students should be informed why it is important for them to know how to use a compass rose. Provided them with examples of maps that contain them. **This lesson is not designed to be an introductory activity in directions. Students should come to this activity with prior knowledge. This lesson is designed to be practice for them. Make note of which directions the students got correct and which ones they struggled with. Revisit directions with them if needed. Children who are creative are willing to try new ways of doing things. They see more than one possibility in how to play a game or use an art material. They are curious about how things work and why things happen as they do. They are willing to take risks. When they try something new and it doesn't work, they learn from their mistakes, and try another approach. One of the easiest ways to promote children's creativity is to fill the environment with open-ended materials. Items children can use in a variety of ways are ideal for school-age programs because they are interesting to children of different ages and stages of development and trigger their imaginations. 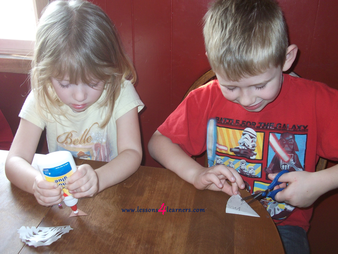 Provide open-ended materials with which children can do many things. Arrange the environment so children can spread out, explore, and be messy. Provide sufficient storage space for projects and creations that cannot be completed in one day. Allow creations to stay in place for several days so children can continue using them and possibly expand them. Provide sufficient time in the daily schedule for children to make plans and carry them out. Follow a daily schedule that includes long blocks of time when children are free to organize their own games and activities without adult involvement. Surround children with examples of creative work - reproductions of paintings and sculptures, award-winning children's literature, photographs of architectural treasures, biographies of investors and scientists, a wide variety of music on tapes and CD's. Store materials and equipment where children can easily select, replace, and care for them without adult assistance. 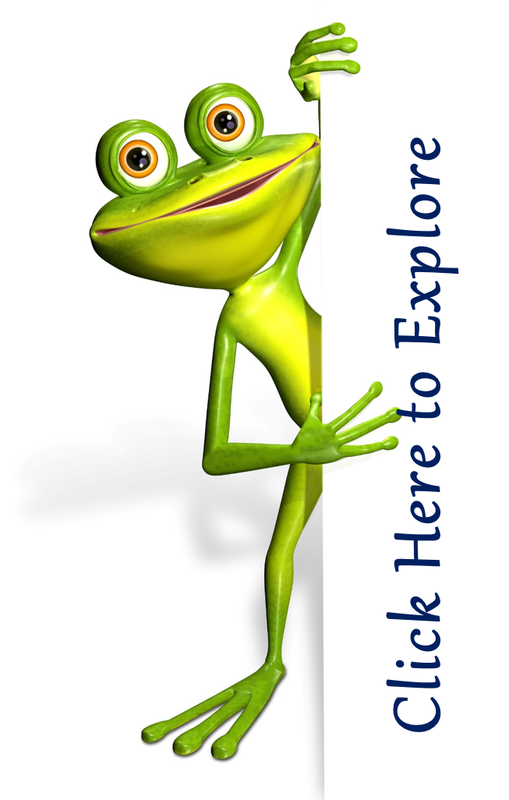 Offer materials that allow children to explore subjects and interests introduced at school or through experiences such as field trips.